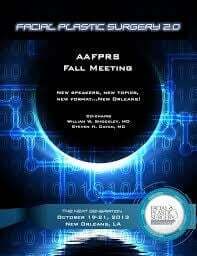 Revision Rhinoplasty expert, Russell Kridel, MD was an invited speaker at the American Academy of Facial Plastic & Reconstructive Surgery (AAFPRS) 2013 Fall Meeting called “Facial Plastic Surgery 2.0” held October 19-21 in New Orleans. As an internationally recognized expert on Rhinoplasty and Revision Rhinoplasty surgical techniques, Dr. Kridel was asked to share his expertise with other physicians attending the meeting. Minor Revision Rhinoplasty provides little difficulty, but major revisions are incredible challenges to even the most skillful Rhinoplasty surgeon, often requiring significant corrections of scarring, previous over-resection, asymmetries and irregularities often worsened by vagaries of healing. The surgeon often must first recreate with grafts the normal anatomy before even attempting an aesthetic improvement. At times the aesthetic result from the first surgery also is complicated by new airway problems that must be addressed. At the conclusion of the course, physician participants were able to recognize what causes major problems in Rhinoplasty so they can avoid them. And, they became familiar with grafting options and harvesting skills in Revision Rhinoplasty techniques proven effective by Dr. Kridel. Rhinoplasty is known to be one of the more technically challenging cosmetic procedures, and the rate of Revision Rhinoplasty reported in the literature ranges between 5- 15%., Revision Rhinoplasty may range from minor deformities that can be treated in the office to major cosmetic and functional defects that require multiple surgeries to correct. Review of the literature lacks a uniform scale which systematically evaluates the patient presenting for revision rhinoplasty. Dr. Kridel and Dr. Rodman described 3 major components that determine the overall difficulty of the Revision Rhinoplasty surgery. They outlined a staging system which objectively stratify complexity of Revision Rhinoplasty for the benefit of the surgeon and to appropriately counsel patients. The Rhinoplasty prognosis is not measured in terms of survival, but what is possible versus an impossible surgical result. The pre-operative staging system laid out by Dr. Kridel and Dr. Rodman can help patients understand the complexity of the repair required and help manage expectations. Further, this system will facilitate exchange between Revision Rhinoplasty surgeons. A standardized evaluation system will allow for meaningful comparisons surgical techniques and evaluation of outcomes. Dr. Kridel has published over 100 scientific journal articles and textbook chapters on facial plastic surgery techniques, including Rhinoplasty and Revision Rhinoplasty. Known as one of the leading Rhinoplasty surgeons, he is often referred to as "The Nose Doctor" by peers and patients. Dedication to sharing ideas on the latest techniques with other skilled surgeons from around the world keeps Dr. Kridel at the leading edge of his profession. Schedule a consultation with Dr. Kridel by calling (713)526-5665.